Ten Speed Press, 9781607740087, 256pp. Just a century ago, cheese was still a relatively regional and European phenomenon, and cheese making techniques were limited by climate, geography, and equipment. But modern technology along with the recent artisanal renaissance has opened up the diverse, time-honored, and dynamic world of cheese to enthusiasts willing to take its humble fundamentals—milk, starters, coagulants, and salt—and transform them into complex edibles. 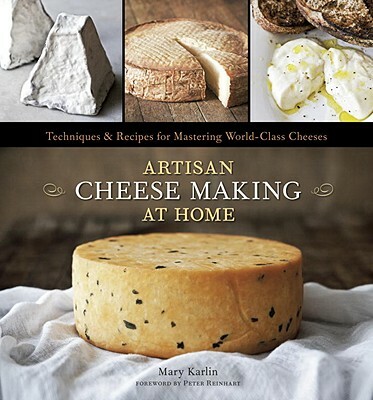 Artisan Cheese Making at Home is the most ambitious and comprehensive guide to home cheese making, filled with easy-to-follow instructions for making mouthwatering cheese and dairy items. Renowned cooking instructor Mary Karlin has spent years working alongside the country’s most passionate artisan cheese producers—cooking, creating, and learning the nuances of their trade. She presents her findings in this lavishly illustrated guide, which features more than eighty recipes for a diverse range of cheeses: from quick and satisfying Mascarpone and Queso Blanco to cultured products like Crème Fraîche and Yogurt to flavorful selections like Saffron-Infused Manchego, Irish-Style Cheddar, and Bloomy Blue Log Chèvre. Artisan Cheese Making at Home begins with a primer covering milks, starters, cultures, natural coagulants, and bacteria—everything the beginner needs to get started. The heart of the book is a master class in home cheese making: building basic skills with fresh cheeses like ricotta and working up to developing and aging complex mold-ripened cheeses. Also covered are techniques and equipment, including drying, pressing, and brining, as well as molds and ripening boxes. Last but not least, there is a full chapter on cooking with cheese that includes more than twenty globally-influenced recipes featuring the finished cheeses, such as Goat Cheese and Chive Fallen Soufflés with Herb-Citrus Vinaigrette and Blue Cheese, Bacon, and Pear Galette. Offering an approachable exploration of the alchemy of this extraordinary food, Artisan Cheese Making at Home proves that hand-crafting cheese is not only achievable, but also a fascinating and rewarding process. Mary Karlin is a passionate cook, cooking teacher, freelance food writer, and the author of Wood-Fired Cooking. She was a founding staff member and is currently a visiting chef-instructor at the award-winning Ramekins Culinary School in Sonoma, CA, where she has taught cheese making, wood-fired cooking, and Mediterranean-themed cooking classes for more than ten years. Mary is also a chef-instructor at Relish Culinary Center in Healdsburg, CA, and Great News! Cooking School in San Diego, CA, as well as at other culinary organizations around the United States. Mary splits her time between Northern California and Arizona. Visit www.artisancheesemakingathome.com.